KANSAS CITY, Mo. 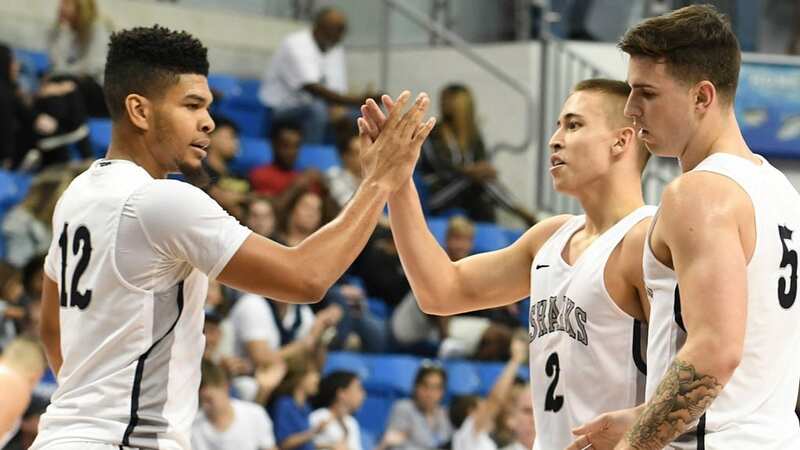 – One of just six remaining unbeatens in all of NCAA Division II, Nova Southeastern crept up to No. 4 in the latest National Association of Basketball Coaches (NABC) poll, announced Tuesday afternoon. Back in full swing following the holidays, the Sharks opened the New Year with a pair of commanding Sunshine State Conference wins over both Rollins and Florida Tech to improve to 12-0 overall. Head coach Jim Crutchfield‘s club used 16 three-pointers, including 11 in the first half, to dismantle the Tars last Wednesday before limiting the Panthers to only 21 first-half points en route to an 82-62 victory this past Saturday. Nova Southeastern is one of three SSC representatives among this week’s Top-25, joined by No. 21 Lynn and No. 22 Florida Southern. The nation’s Top-3 remained unchanged with No. 1 Bellarmine collecting all 16 first-place votes. Meanwhile, South Carolina-Aiken entered the Top-5 after previous No. 4 Saint Anselm slid to following its first loss of the season. The Sharks will welcome Eckerd to the Rick Case Arena tomorrow night at 7:30 p.m. For complete coverage of the action, follow the Sharks on Twitter @NSU_MBasketball or visit the schedule page on NSUSharks.com.